The owner of an historic garage in Glasgow's west end is due to set out revised proposals for its development. Sir Arnold Clark abandoned plans to build flats and retail space on the site of the Botanic Gardens Garage in Vinicombe Street after a public outcry. The 100-year-old structure is believed by some heritage experts to be the world's oldest multi-storey car park. The new proposals are expected to be made public during a meeting at the site on Wednesday evening. John Clark, from Arnold Clark Automobiles, said: "We hope that our amended plans will be welcomed by local residents. "We have managed to source specialist companies to restore the majority of the building's architectural features, including a company who will use specially commissioned tiles, to rebuild the building's frontage. "We look forward to presenting these amended plans to the local residents at the public consultation and hope that they suit all parties involved. "Once we have received feedback from the local residents we will submit our newly revised refurbishment plans to Glasgow City Council." Botanic Gardens Garage is the oldest motor garage surviving in Glasgow. Designed by David V Wyllie and built between 1906 and 1912, it has a distinctive façade of green and white glazed terracotta tiles. 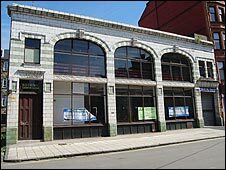 Sir Arnold Clark originally put forward plans to demolish the building and replace it with a new four-storey structure incorporating flats, cottages, retail space, and a restaurant. But he withdrew these after more than 100 local residents objected. Following successful lobbying by campaigners, Historic Scotland upgraded the garage's listed status from category B to Category A. This put it on a similar level of importance as Edinburgh Castle and Kelvingrove Museum.